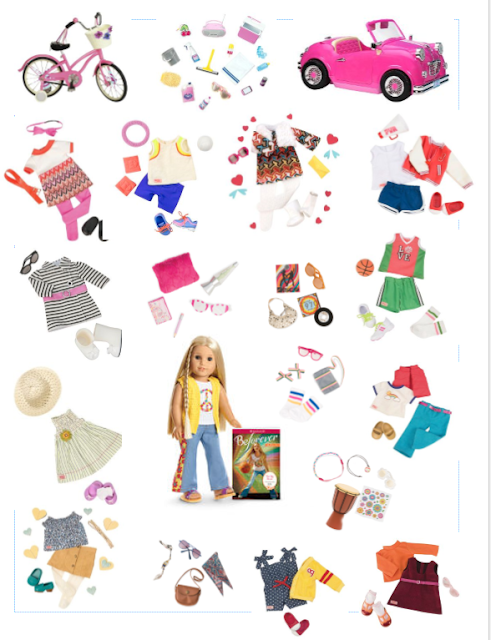 News, photostories, reviews and more for American Girl dolls! Sorry for Abandoning this Blog...Im on Instagram now! Also I will be posting this real quick since it is hard to post it on Instagram, and I will be linking it on my insta account. Below is a compilation of Our Generation outfits, furniture, and accessories that I feel would work well with various Beforever and GOTY characters. 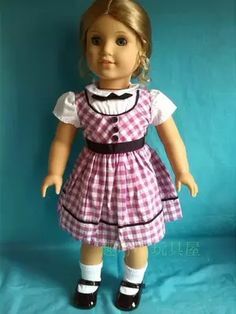 Its always fun to see what we can add to our collections when we have everything from AG for a character, or they are retired, such as past GOTY dolls. I tried to stick with mostly still "in stock" merchandise on target.com and new items. 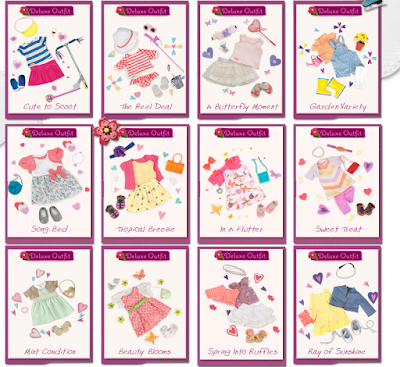 A few outfits show "___ remaining order soon!" so if you see something you like, check on its stock! 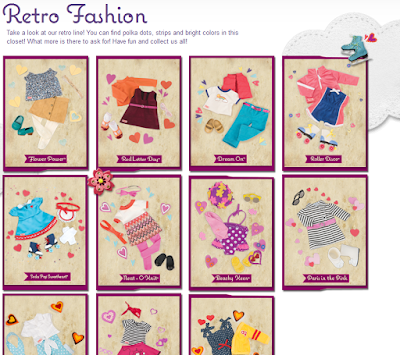 For example the retro school outfit only has 8 left. Enjoy! For Chrissa, I had to include swimwear and the new picnic table! The picnic table is so similar to the one Chrissa had in her collection in 2009, so if you missed out Target is the place to go. I also included winter wear since a lot of her story takes place in cold weather. I really like the new yellow snow outfit with the sled, because its similar to the one Chrissa had. And of course her set wouldn't be complete without the sewing table since she likes crafts! Grace has a lot of cool stuff at Target too since OG tried to cater to the baking/Paris craze last year. I included a lot of outfits that had her color theme or had a Paris feel to them, like the one on the bottom right. The new bulldog pjs are perfect for Grace because they have her color scheme and she has a French bulldog. 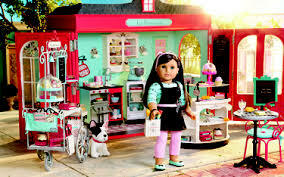 I included the baking sets, the food sets with french desserts in them and the ice cream truck of course! I also added the traveling set for her trip to Paris. And a scooter just for fun! Isabelle has a lot of cute stuff too. I forgot to add the sewing machine though oops! Also the OG wooden wardrobe is good for all her outfits. I added dance outfits and cute outfits for school that are - well a bit overkill on the pink but they seem to be her style. The bed looked perfect for her as well. And I added some friends!!! 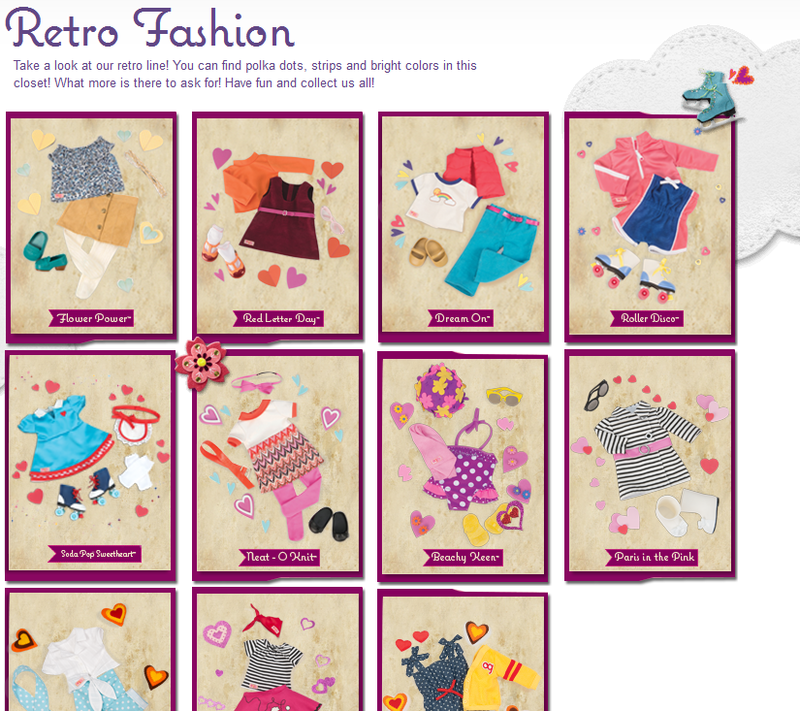 Julie has lots of items since OG has been making 70s retro outfits as well. I added the car and car wash set since she used to have a car, and a bicycle. I of course had to add a basketball outfit and some sporty clothes. I really like the new retro outfit (below the car) because it has a "J" on the jacket! How perfect for Julie! I added all of the 70s retro accessory packs, and the lava lamp set. Plus the sundress and hat for strolls on the beach. Dang I can't wait to shop at Target myself now. 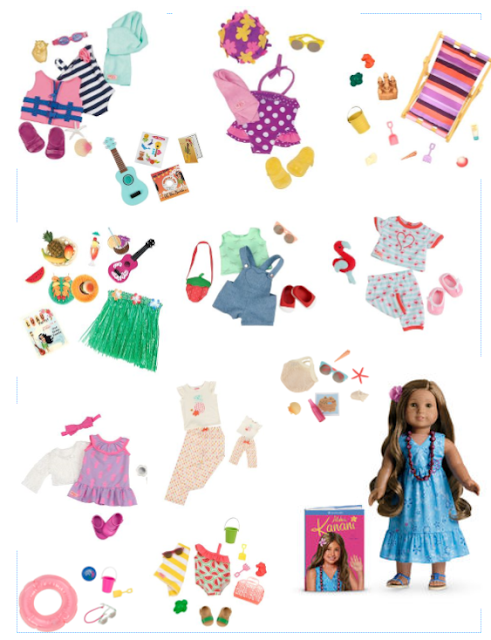 There are quite a few beachy, Hawaiian items for Kanani! I included the new purple pineapple dress that is similar in theme to her luau outfit. 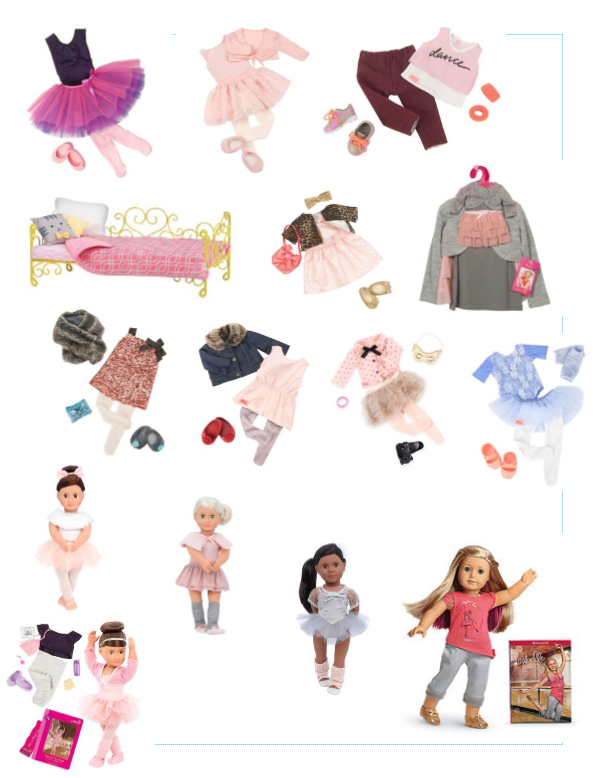 There's also pineapple pajamas for dolls and girls. The flamingo ones are cute too. It wouldn't be complete without the Hawaiian grass skirt set and swimsuits! Of course Lanie has the camper :D. And the bird watching set. 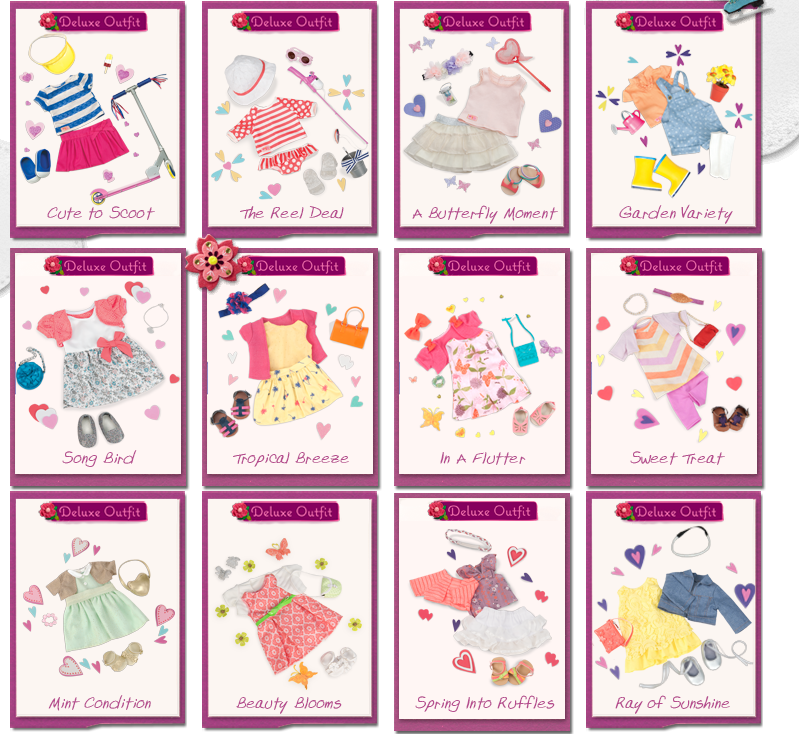 I included mostly outdoorsy outfits, like the overall set with the strawberry bag, which is new. And I suppose Moose pjs would be fitting for an animal and environment lover. And Lea, our current girl of the year!!! 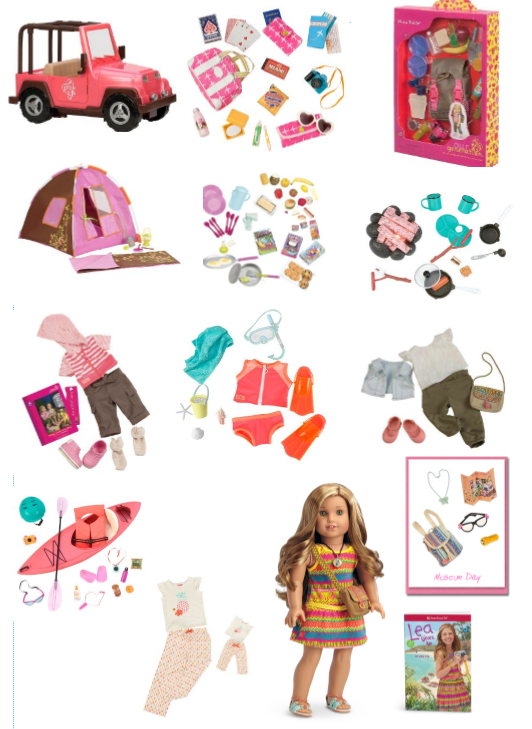 I included the kayak, snorkeling gear, hiking and camping gear, and some outfits that are similar to her hiking outfit. I also added traveling supplies for her trip to Brazil and a Jeep which fits in well with the movie. Maryellen by far has the most. I included the camper because she was originally supposed to get a 1950s airstream camper and summer outfit last year, but it never happened so it may have been scrapped by AG. I also put the car and the baby blue laundry set. And the diner of course. I have two 1950s party dresses, the poodle skirt set, several cute 1950s dresses and the car hop oufits. 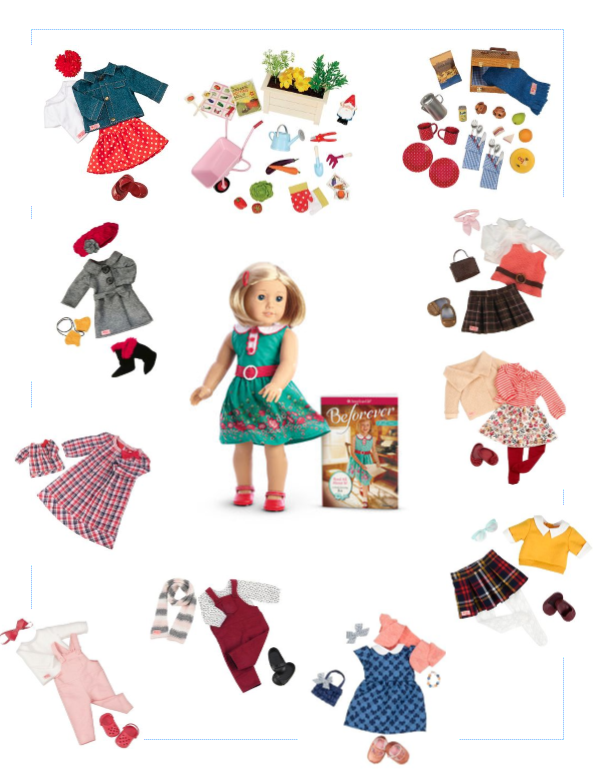 I also included three adorable new 50s outfits (above Maryellen in picture), plus the girl scouts set! The loft bed sets are at Toys R Us and Walmart if anyone is wondering. 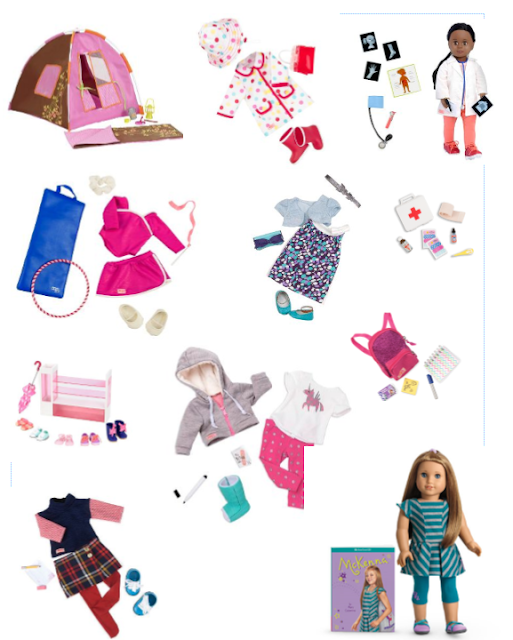 I included the tent for her camping trip with Josie, rain gear for Seattle weather, the new get better soon outfit set with the leg cast, the new plaid school outfit, the shoe caddy to store her rain boots and umbrella, and school supplies. Plus the gymnastics outfit. I thought the pjs with the penguin match perfectly with Mia's set. Basically all the ice skating outfits and winter gear. I couldn't find any art stuff so I combined Nicki and Saige's love of horses. I put all the riding outfits and some country type outfits. 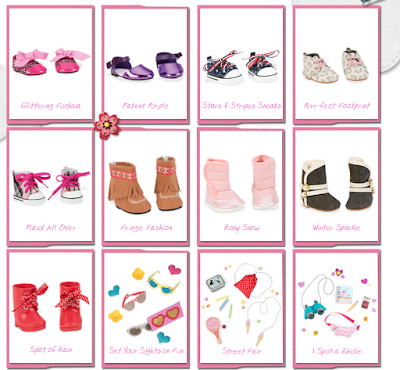 The outfit on the bottom left is perfect for Saige. I also included a dog for Nikki to train and a lemonade set for Saige's lemonade stand attempts with her friends. And lastly Samantha. She didn't have as many truly era accurate outfits, but I picked ones that are close. The coat is absolutely perfect and the pajamas are close enough. I also thought the outfit with the hat would look cute on her as well as the lacy dress with the apron. I included the canopy bed and tea set. Well I hope you all enjoyed!!! I had a lot of fun with this! Follow me on instagram for all my doll fun and updates! 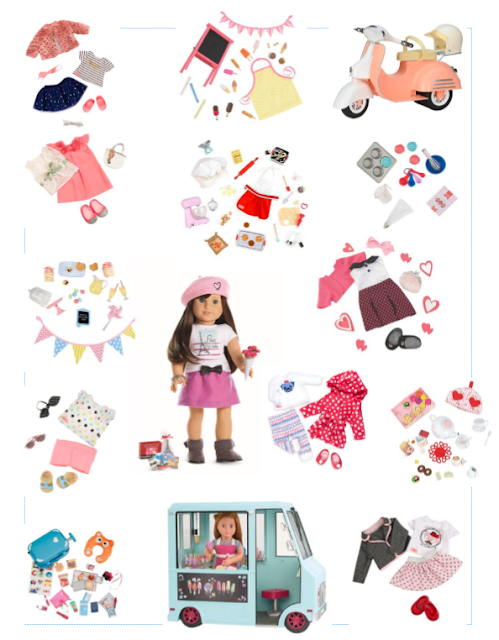 I'm Back + Doll News! Sorry I've been gone so long. College and doll collecting sometimes don't mix lol! What a great time to be back though! 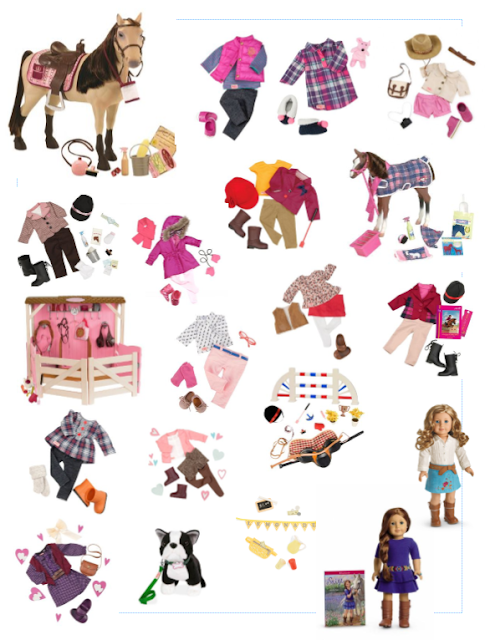 Its getting quite festive in the American Girl world lately with all the Christmas items and exclusives arriving in stores this week. In fact, I will be heading to the store this weekend so expect a lot of updates on the exclusives. I will also be meeting Valerie Tripp at the store! YAY She wrote Felicity, Molly, Kit, Josefina, and Maryellen's stories. She's quite the veteran, and Maryellen has recently won the 2015 Parenting Choice Silver Award! Congratulations to Valerie and her character Maryellen! The in-store exclusive PWP is the snowflake dress with headband or the Santa dress with Santa hat. Both are $14 with $50 or more purchase. I will be buying the Santa dress one because I already have the black boots. 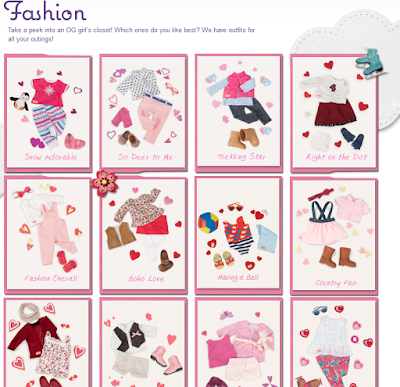 I think its crazy how these outfits don't come with shoes but oh well. See agupdatenews on instagram for photos. I will have photos on Saturday or Sunday! Grace's bakery is SOLD OUT. The bistro table set and the bakery cart have very low inventory, so consider buying those soon if you want them! More in-store exclusives include a notebook and pillow for girls, headphones, a silver heart purse for the Christmas dresses, hats and gloves for girls, and necklaces and earrings. All of these items range from $10-$20 which is quite a deal! 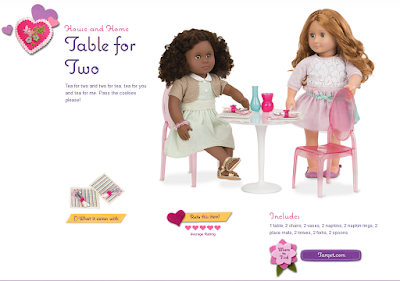 American Girl is rumored to have a new salon chair and salon background coming soon. There are some other TBA backgrounds also. 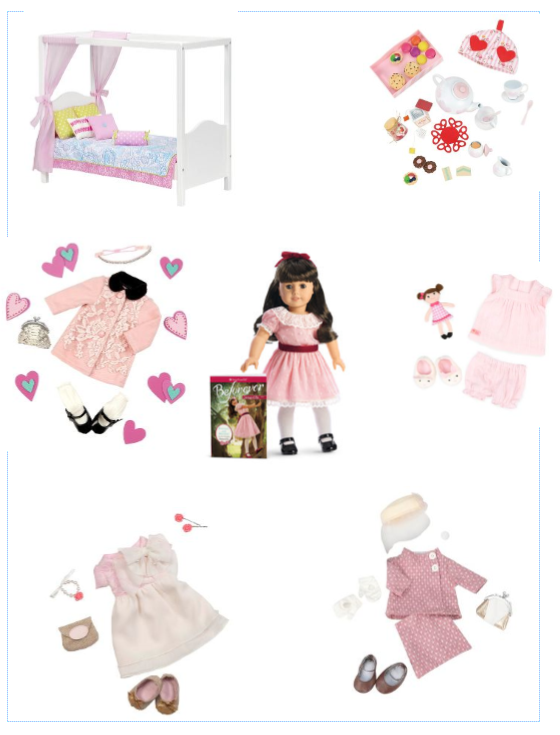 New doll and girl store exclusive pajamas are supposed to be arriving this month also. And don't forget to save your money for the in-store exclusive holiday ball gown that's coming in November! 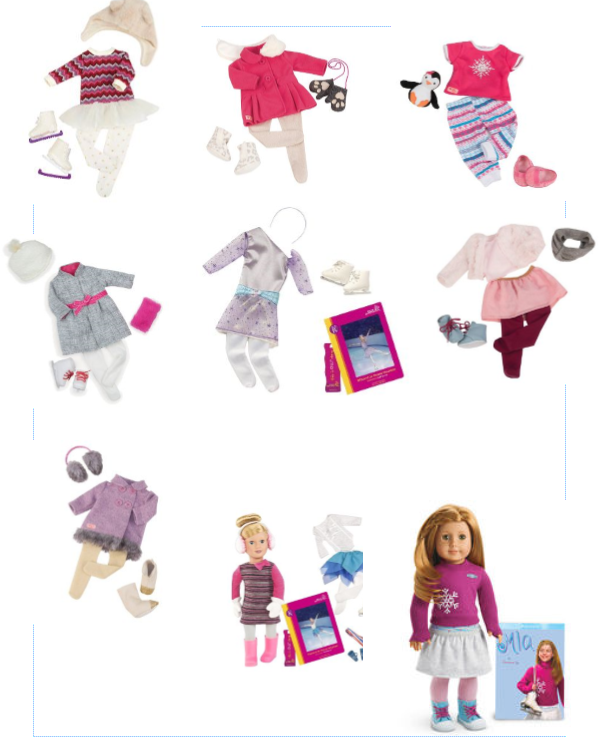 American Girl has also updated their sale page to include several girl sized retired pajamas from when they updated the bedtime sets last June. With this I would expect the old pajamas to show up on the Cyber Monday sale. Julie's sold out but there could be some left. I know Kit's and Rebecca's didn't sell out before the relaunch so definitely expect those for around $14-$16. More Lea Clark leaks and information are hitting the web, so look for a separate post on that. Also I will be investigating Beforever 2016 character that is rumored to release alongside Lea on January 1, 2016 because of the Amazon book release date. This could be a mistake, but it could be true since its American Girl's 30th anniversary! The Our Generation website has been updated! 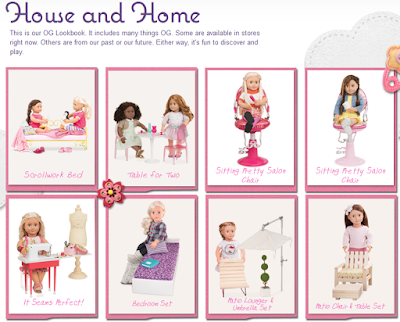 There are lots of cute outfits, accessories sets, and some furniture even! 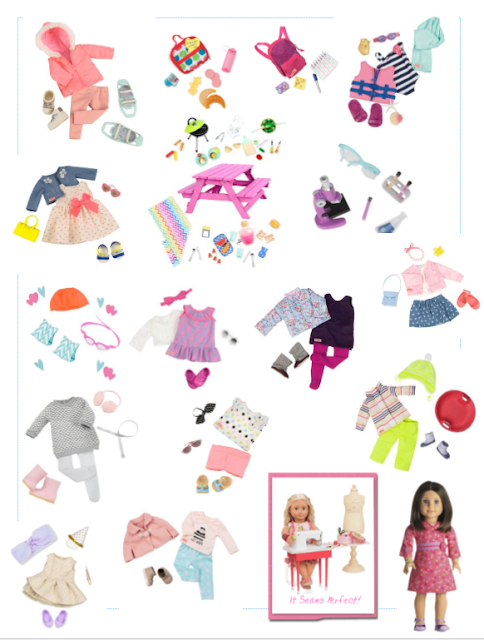 For the regular fashion, there is a cute penguin pajama set, some hiking outfits, a cute sport outfit, overalls (I'm getting those for Kit and dressing them up a bit), and another skirt and shirt set. More accessory sets! 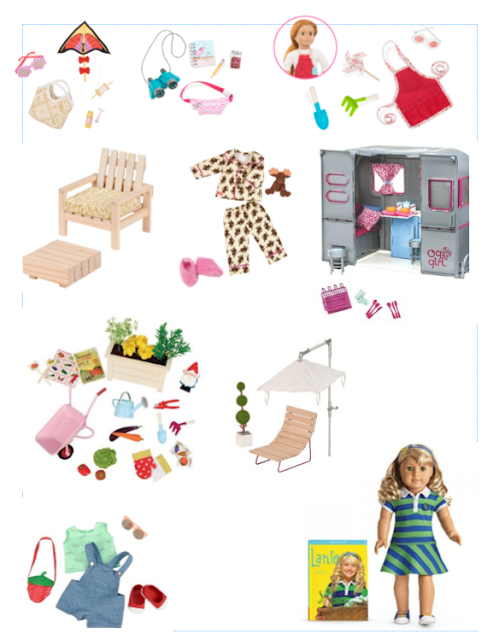 The gardening set is a perfect addition to American Girl's gardening bench set. Especially since there's been a lot of complaints that it only came with one tool, but two hooks. Target came to our rescue with this set! The second one is a VIP concert set, and there's also a cute beach set. OG made some nice shoes this time, and the roller skates will be perfect for Maryellen. I like the Spring Into Ruffles set on the bottom. It has a white skirt that will work nicely with Grace's collection. Retro fashion!!! The first one I'm not as thrilled about, but the second two I'm buying for Julie. She needs a school jumper set and a rainbow shirt! 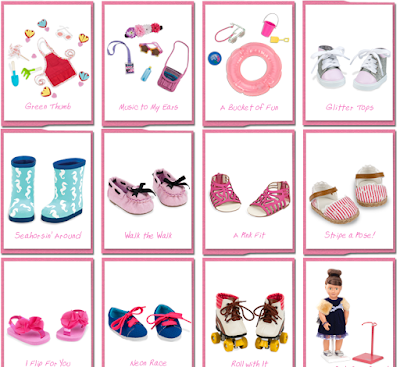 The last one is a cute new roller skate outfit that I will buy for Maryellen. Lovely new adventure sets! Finally a Girl Scouts set! 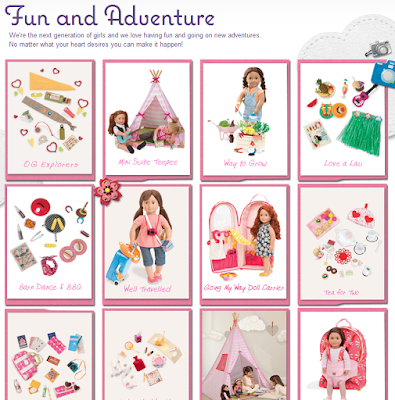 On the website it shows the things on a doll with a Girl Scout uniform. I wonder if that outfit will be coming soon too? The best set is the vegetable garden set with a cute wheelbarrow! The vegetables can be taken out of the planter box as well. I can't wait to get this set!!!! There's also a lua set that would be great for Kanani, and a grill! I saw the grill in the store and OG hit the jackpot with this set. The food is extremely realistic! I'm not sure I'm digging those clear pink chairs that are reminiscent of the good old Barbie's Malibu beachouse days.... The table looks cute for Grace's bakery however. If it goes on sale, I might buy it and spraypaint the chairs red. 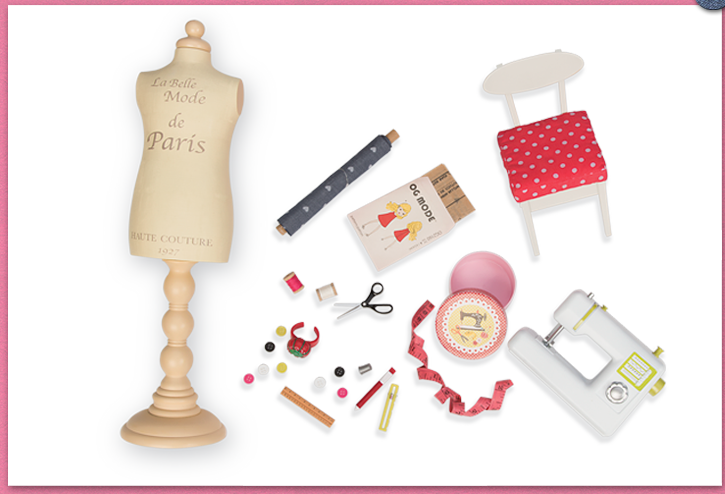 And this is a closeup of what the sewing set comes with. It has a real pattern for a simple dress and enough fabric to make it with! Such a cute idea! to see more details on all the new things. A lot of them are already rolling into stores. 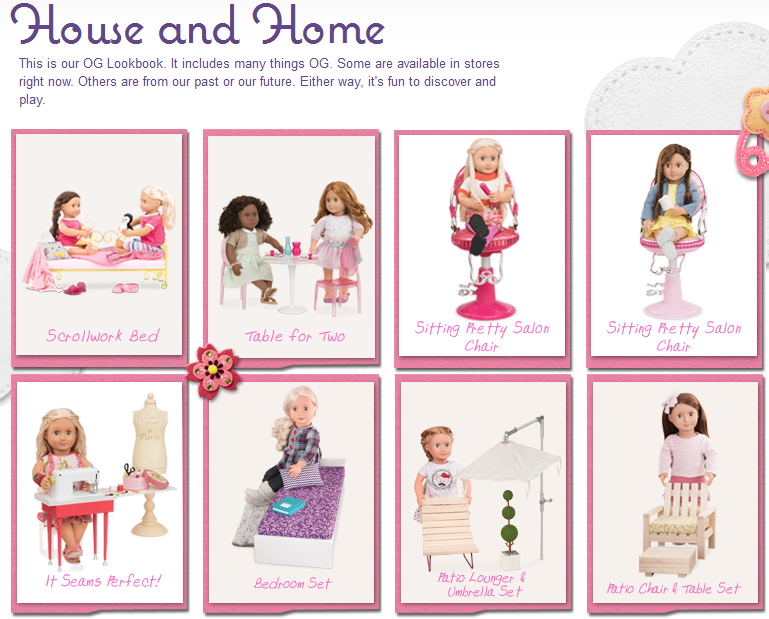 Plus, OG is creating a line of accessories and furniture for mini dolls called LORI by OG. They have created a retro car and a camper for the mini so far. 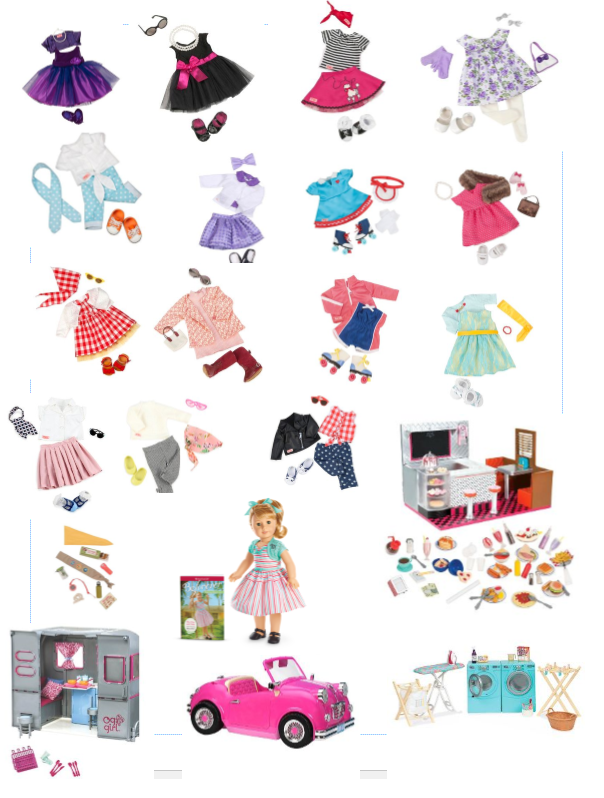 The camper has working lights and kitchen accessories, and will be a great addition to the Maryellen mini doll! Quick Info ~ Jill's Steals and Deals Sold Out! I hope everyone was able to get everything they needed cause all the deals are sold out now! No historical items this time, but maybe we will get lucky next time 'round! 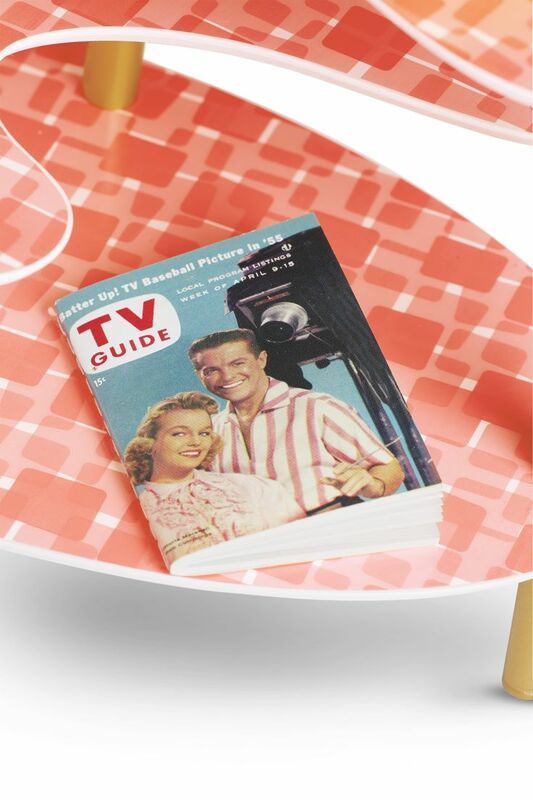 Stock photos have shown up, and with them the prices of Maryellen's collection are available. Some of them are ridiculous, while others are actually quite reasonable. Seaside Diner ~ $275 - a lot less food than OG's, but it looks to have some wooden parts and some plastic parts like Samantha's Ice Cream Parlor. It has two stools and booth seats with real material. I don't know what the inside cooking area looks like yet. Jukebox ~ $90 - plugs into your phone - Im hearing rumors the records spin around inside it and it has elaborate light up features, but this isnt confirmed yet. I hope so for that price! Poodle skirt dress for girls ~ $48? 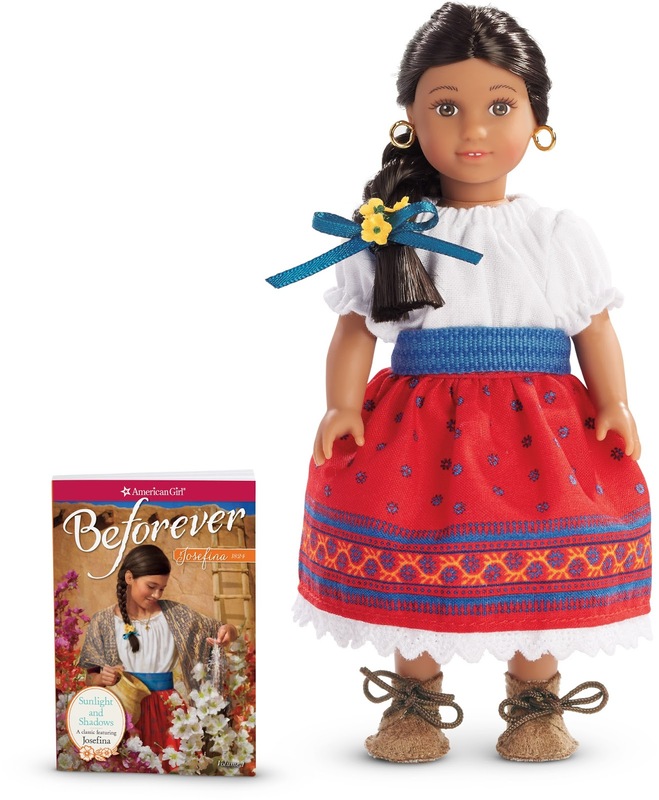 Also, Josefina will get a $20 hairstyling set, a Journey book, a mini doll, and a rumored outfit. I haven't actually seen the outfit so I cannot confirm that at this time. Some stock photos are available if you would like to see here. 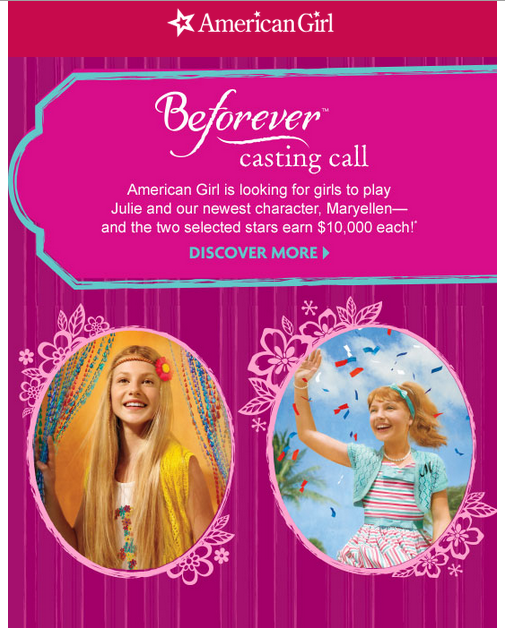 I talked about in a previous post that American Girl did a contest for creating two 15 minute short films for Julie and Maryellen. 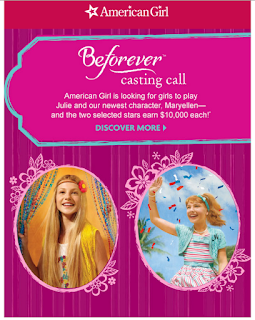 The short film script and pitches are completed, and now American Girl is looking for talent between the ages of 8-14 to portray these two characters! The winners receive $10,000 and a trip to film the movies. It sounds really exciting and the opportunity is expanded to more people than usual. Some people are receiving this email, while others are not. Let me know if you receive it! American Girl has given us another sneak peak on Pinterest! This one is of her three level living room table. 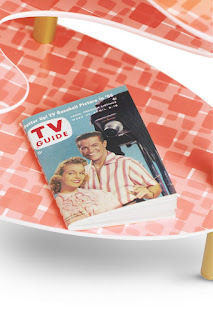 It has such a cute TV guide! I'm not sure if this will be available separate from the TV or if it comes with it. Very cute sets so far for Maryellen!